Did you know that some puppies do not survive the tail docking procedure forced upon them? It's a medical fact that tail dockers would never admit is true. Puppies in general are so helpless, frail and tiny, and their immune system is not fully developed. They are easily susceptible to a whole host of medical issues if they are injured, including infections and death. It's a scientific fact that is detailed in a recent Pet MD article. So, puppies that do not have a fully functioning immune system are subjected to a cruel practice where a body part is cut off. I have personally seen it happen with a litter of docked puppies that was brought into the shelter I volunteer with last year. One of the puppies was so bad off that they did not make it...it was awful! I know for a fact that one of the other puppies that was adopted by a friend of mine, has terrible issues with her tail nub to this day. I would almost guarantee that unfortunately, the other pups that were adopted out from that litter are dealing with nerve pain and damage from the terrible docking procedure they endured. Tail docking is a terribly painful practice that has been inflicted upon millions of little newborn puppies in the name of "breed standard". Tail docking is the severing of skin, flesh, muscles, nerves, tendons, and bones of the spine, called vertebrae, and no matter what tail docking advocates might say, it is a terribly painful, tortuous assault on each puppy who must endure it. 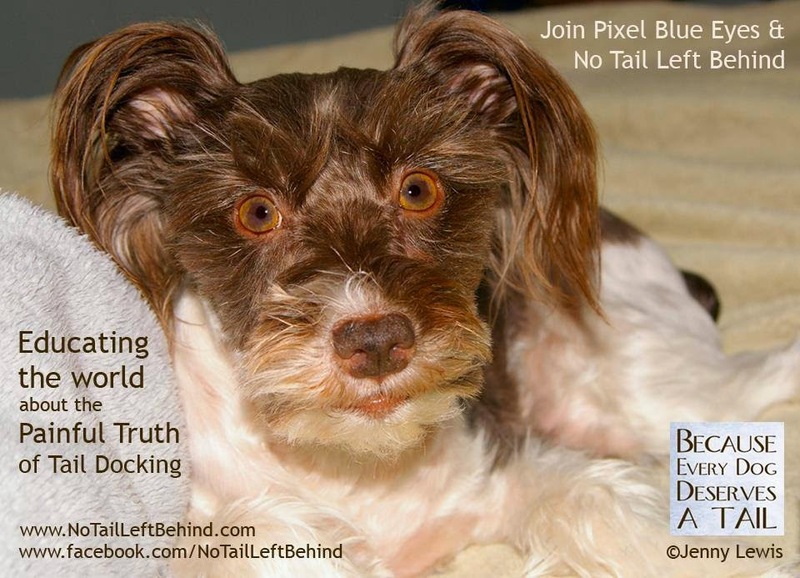 Some dogs, like Pixel Blue Eyes, our spokesdog and inspiration for the No Tail Left Behind campaign, endure a lifetime of chronic pain, discomfort, infections and difficulties because of the "simple" tail docking. Proponents of tail docking have a small list of reasons as to why tail docking is so important and must be done, but not a single one of their reasons has full logic behind it. Tail docking doesn't promote health, it doesn't protect the tail from injury (it creates an injury instead) and it doesn't promote a cleaner tail area (ever seen a docked tail on a Pomeranian that has a super fluffy tail?). Think about this for a moment...tiny innocent puppies are born into the world with hope and innocence, dependent upon their dog mother and the humans that care for them. They can't open their eyes yet, they can't do anything except depend on others. Then within days of birth, when they are just learning to trust, and are still working on building an immune system of their own that is crucial to their survival in life, these tiny little puppies are taken from their mother and without anesthesia, each tiny puppy has their tail cut off. The puppy is screaming and crying out, wiggling and writhing in the hands of the person or persons who are torturing them. Then a spot of glue or just a bit of styptic powder is placed at the tip, and they are placed back with their mother to try and nurse away the pain. Can you imagine the suffering they experience? Why don't tail dockers care that this is happening? It has already been proven that puppies have incredibly sensitive pain receptors that actually feel pain at an even greater level than adult dogs. The torture these puppies endure is animal cruelty, yet no one is doing anything to stop it in the United States. This is the look Pixel gets on her face when her tail nub nerve pain starts. There are so many dogs silently suffering from the long term effects of being maimed at the most vulnerable point in their life...dogs just like Pixel. I have been contacted by dozens and dozens of pet parents whose dogs suffer from docked tail pain, just like Pixel does each day. That is why each of us must take a stand. That is why No Tail Left Behind was started, to help be a vessel, a voice, of CHANGE. The needs, feelings, health and physical and emotional well being of a dog MUST overpower the pointless "Breed Standard" that maims certain breeds of dogs calling it "necessary" for their health. Wouldn't their health be better served if a crucial communication body part was NOT cut off? Here are some things you can do RIGHT NOW, TODAY to help bring awareness and change for puppies across the United States. 1. Join us in the fight by following us on Facebook, Twitter and signing up to get this blog by email. 2. Educate others in a kind but factual way. Share our message with your family, friends, veterinarian and everyone you meet. So many of our supporters have told me, "I just never knew it hurt the puppy" or "I never really thought about it as cruelty" and it has inspired breeders to stop docking and has changed hearts and minds all over the U.S. and abroad. 3. 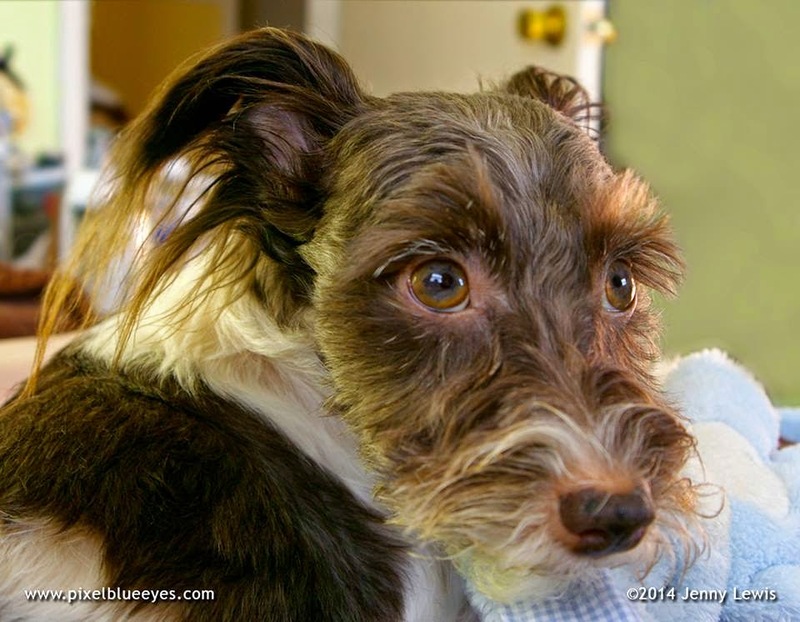 If you are looking to get a dog from a breeder, search for one that does not dock tails. If you cannot find one that doesn't dock, then insist that they allow you to choose a puppy before they dock. 4. Don't purchase a dog from a breeder that docks tails. The biggest way to make them stop docking is to refuse to give them your money. If you hit them in their wallets, they just might get it. 5. Contact your State Congressmen and Senators. 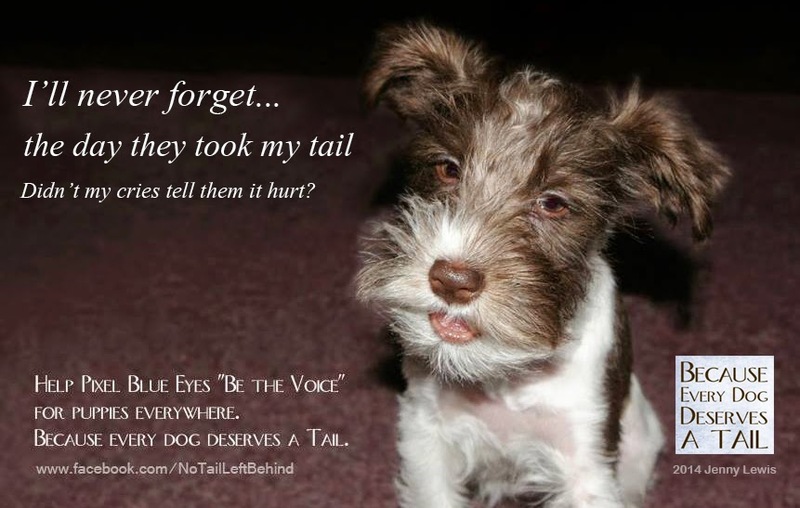 Write letters to all of them sharing the message of No Tail Left Behind. Tell them that animal cruelty is defined as the crime of inflicting physical pain, suffering or death on an animal. 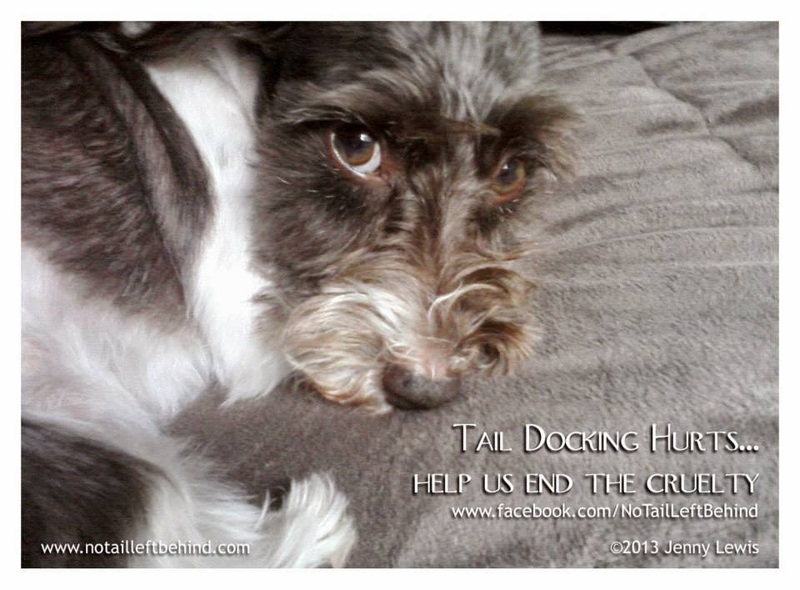 Tell them that tail docking is animal cruelty and it must be stopped. The ASPCA has an excellent "Search by State" web page where you can do further research based on the state in which you live. Help us make a difference. Help us spread the message. 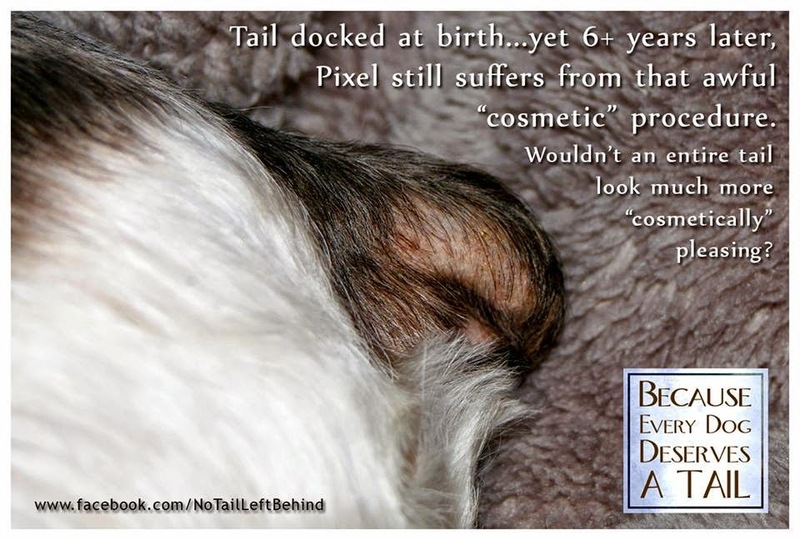 Help us end the suffering as we educate the world about the painful truths of tail docking. No Tail Left Behind...because EVERY dog deserves a tail! 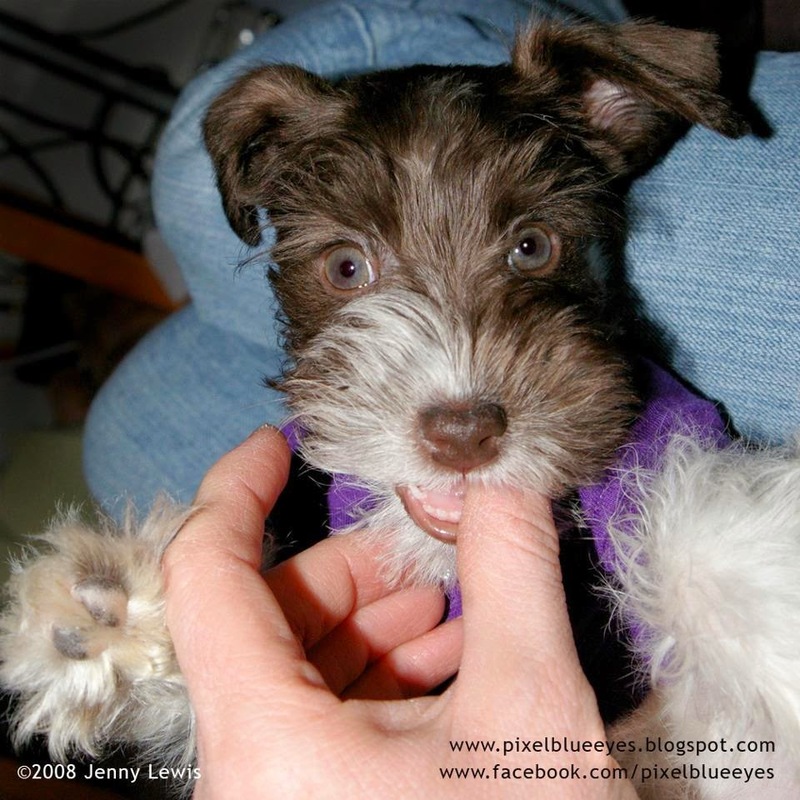 Pixel Blue Eyes and her Mom Jenny Lewis are taking part in the "Blog the Change for Animals" special blog hop today. Please visit some of our fellow pet blogging friends below as they share animal advocacy topics that they are passionate about.